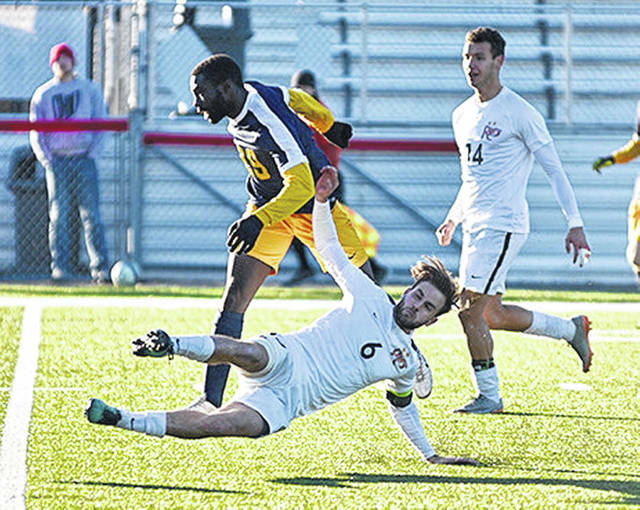 Rio Grande’s Eduardo Zurita follows through on his game-winning goal in Saturday’s 4-3 overtime victory against WVU-Tech in the River States Conference Men’s Soccer Championship final at Jackson High School’s Alumni Stadium. JACKSON, Ohio — Eduardo Zurita’s goal with 43.2 seconds remaining in overtime lifted the University of Rio Grande to a 4-3 win over West Virginia University-Tech, Saturday afternoon, in the River States Conference Championship final at Jackson High School’s Alumni Stadium. The game was moved from Rio Grande’s Evan E. Davis Field due to poor field position. The top-seeded RedStorm, who were also ranked No. 1 in the most recent NAIA coaches’ poll, improved to 18-0 with the victory. WVU-Tech, the tourney’s No. 2 seed, slipped to 14-2-4 with the loss – both of which came at the hands of Rio Grande. The Golden Bears, who eliminated the RedStorm in the semifinal round of last year’s tourney, appeared poised to record a repeat performance after scoring three second half goals – against an opponent which had allowed just two goals all season – to erase a 3-0 halftime deficit. Rio grabbed its first half advantage thanks to a trio of goals in a span of just under 11 minutes, two of which came off corner kick opportunities. Freshman Nicolas Cam Orellana (Santiago, Chile) headed in a corner by senior Harry Reilly (Coventry, England) with 22:18 left before the intermission to make it 1-0. Reilly scored off an assist by Zurita with 15:30 remaining before the half, while senior Mitchell Osmond (Sydney, Australia) headed in another Reilly corner just over 3-1/2 minutes later to give the RedStorm a seemingly comfortable 3-0 lead. Jaime Rodriguez got Tech on the board just under 4-1/2 minutes into the second stanza thanks to an assist by Sergio Sanchez, while Sanchez got in on the scoring act with the aid of an assist by Eduardo Gutierrez to draw the Golden Bears to within 3-2 with 13:27 remaining in regulation. Cristian Cubedo then completed the comeback, scoring off a pass from Allan Costa with 4:01 left, to knot the score at 3-3. WVU-Tech had two shots in the extra session, including one by Gavin Shiels with 1:13 remaining which was saved by Rio junior keeper Richard Dearle (Castle Donington, England). Zurita, a senior from Sant Boi de Llobregat, Spain, scored the game-winner for Rio 30 seconds later, taking a crossing pass from junior James Williamson (San Jose, Costa Rica) and poking the ball away from a Golden Bear defender before providing a final touch that eluded Tech net-minder Jorge Martinez. Rio Grande finished with a 15-14 advantage in overall shots, although Tech had a 9-7 cushion in shots on goal. Dearle recorded six saves in the winning effort. Martinez had three stops in a losing cause. Rio Grande will host Lawrence Tehnological University in the opening round of the 60th annual NAIA National Tournament on Saturday. Kickoff is set for noon at Evan E. Davis Field.